It may be five months to Election Day, but the midterm campaign season is beginning to heat up. Our new CBS News Hot Races map, debuting today, now shows you at a glance where the action figures to be this Fall: which states shape up as the most competitive battlegrounds, the races that look to be nip-and-tuck the whole way - and others that could still intensify up as summer rolls on... there is, after all, a long way to go. The midterms begin in earnest against the backdrop of what Americans say is still a very tough economy: eight in ten think it is in bad shape, and they're overwhelmingly concerned about their own finances. That means that for all the watching of individual races we'll do for the next few months, watching perceptions of the economy - if they move - may matter most in the end. As the map shows, there are plenty of states poised to see battles. 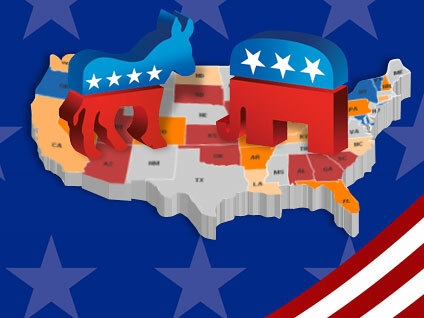 Looking at the Senate state by state, we see a few different electoral stories emerging: there are places where the Democrats trying to hold onto gains they made in 2008 in newly-blue states with shifting populations, like Nevada and Colorado; there are the traditional battleground states like Pennsylvania, Ohio, and Florida, once again at the center of attention. And even usually-blue states like California, Connecticut and Washington have Democrats in what look like tough fights, pitting them against challengers eager to get in on any Republican wave, if one rises. Given that they face a large 59-seat Democratic majority (with a vice-presidential tiebreaker as a cushion), Republicans will need a good cycle to net a 10-seat pickup. They'll start out confident of holding onto many of their seats in the Midwest and South, and optimistic about a couple of states, like North Dakota and Delaware, where recently opened seats have opened prime pickup opportunities... and from there the math for the GOP likely means meeting the challenge of holding onto their own open seats in perennially-close states like Ohio and Missouri, then probably trying to capture some of those reliably blue states as well. Importantly, a glance at districts where the Democrats have made recent gains shows a battlefield with a lot of territory that's inherently tough for them to defend. In 2006 and 2008, Democrats picked up a lot of seats in more traditionally conservative or Republican-leaning districts. In 2008 alone, 49 Democrats won or held on to seats that voted Republican for president; many of them more rural, small town, southern, and border districts where the Republicans are still strong...so it's no coincidence that criteria alone marks a lot of the seats that appear to be in play now in 2010. All of which is to say, American politics has a way of swinging the pendulum back, at least somewhat. But it's important to remember another historical fact too: incumbents, even in so-called "anti-incumbent" years, often get re-elected. Voters tend to like their own congressperson more than Congress itself. Looking across the 435 districts, it's still early, but there are about 50 seats that already look like they'll see very competitive races, pitting incumbents against strong challenges, having yet another close election in typically-marginal districts, or seeing tough battles for open seats which could certainly flip now without the anchor of an incumbent. All but a few of those are currently Democratic-held, an imbalance that as of right now has the GOP playing offense. Casting the net wider, we're also keeping an eye on a lot of other races that could potentially become heated, too, depending on candidates, fundraising, and other campaign dynamics. Anthony Salvanto is CBS News Elections Director. You can read more of his posts in Hotsheet here.